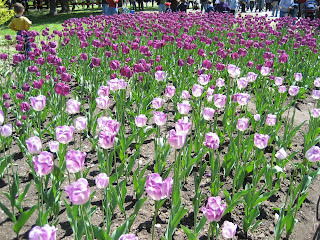 I spent Victoria Day, also known as Journée nationale des patriotes in Quebec, visiting Ottawa for the Canadian Tulip Festival. 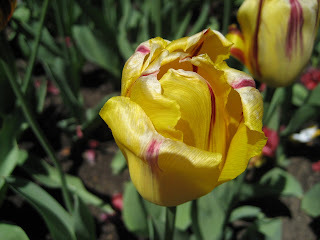 The trip was great with perfect weather and stunningly beautiful tulips. But the best part was this: it was free! We started our trip with breakfast at McDonalds with a Sausage McMuffin with Egg Sandwich, Hash Brown, and Coffee for $4.50. Next, we rode for 2 hours on a friend's 2003 Honda Accord LX. We kept ourselves busy by playing Mario Kart on our Nintendo DS again! 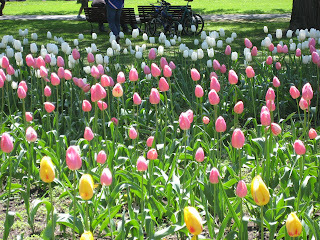 Finally, at 1pm, we parked our car for $3 near the Commissioner's Park and began our tulip trip. My friends were taking pictures with their super expensive Canon Rebel cameras while I was stuck with my point and shoot Sony Cybershot. My camera quickly ran out of battery because I was too stupid not to charge it the night before. Fortunately, some of my friends spend a lot of money and even had back-up batteries for their Rebel! After 2 hours of walking and taking pictures, we finally left for Chinatown Ottawa and had lunch at 3pm at the Mee Xim Vietnamese Restaurant. My girlfriend had a Grilled Pork Chop with Rice while I had the BBQ Beef with Rice. Our dinners together cost only $20.49 + $2.4 tip for a total of $22.89. I'm pretty cheap with tips, right? We then walk around the Byward Market and stopped at the Sugar Mountain on 71 William Street some sweets and dessert. The jelly beans were pretty cheap at $0.02 per gram and we bought $3.96 worth of it. It was a pretty good deal considering that they sell for $2.99/100g in Montreal. We started heading back home at 6:30pm and arrived in Chinatown Montreal at 8:00pm. I was the one driving at 120km/h on the way back since the original driver needed to take a nap and I didn't get caught by cops! Our dinner for the night was Cantonese Cuisine at Keung Kee, one of the best Chinese restaurants in Montreal in my opinion and cheap! We had fried tofu, shrimps in a vegeterian wrap, General Tao chicken, pork, jellyfish and oxyster for $17.50 each. The total spending for the day was $69.35 for my girlfriend and me or $34.66/person. Not bad since a 1 day bus tour at Wonder Travel would have cost us $20 not including the service charge for driver and food!